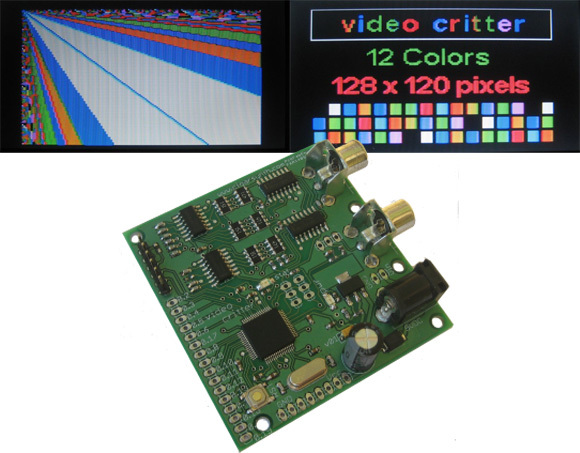 US$74.95 buys you a fully customizable, programmable DIY board with video out. (There’s also a $45 “mini” board that looks equally tantalizing.) The video routines are already programmed into the board, so you can write really easy, higher-level video code to put stuff on the screen. Just as with the Critter Board, you can use C programming from any Linux/Mac/Windows computer. In the meantime, this is a brilliant way of creating some quick, retro-looking custom video effects, and it’ll be ideal for installation work. I have too many other toys to play with to pick one up for at least a couple of months, but if you get one, dear readers, send photos and video.